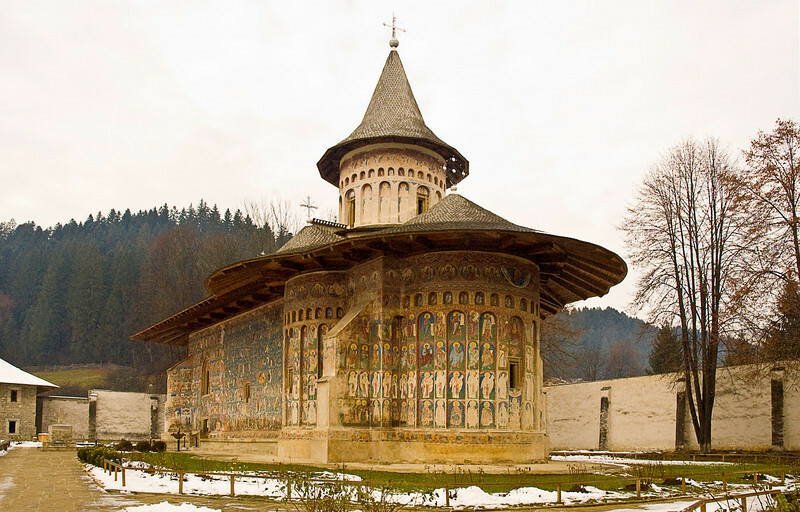 Among the most picturesque treasures of Romania are the Painted Monasteries of Bucovina (northeastern Romania). Their exterior walls are decorated with elaborate 15th and 16th century frescoes featuring portraits of saints and prophets, scenes from the life of Jesus, images of angels and demons, and heaven and hell. Masterpieces of Byzantine art, the frescoes made the story of the Bible and the lives of important Orthodox saints known to unlettered country folk. The churches roofed with notably deep eaves to protect the frescoes. This is Voronet Monastery.